WINNER IS SHELLSEA RUDEN!!! Congratulations SHELLSEA!! Thanks to all who entered! Follow my blog so you don’t miss the chance to enter in future Give Aways!! I am so excited to be finally hosting my first BLOG GIVE AWAY! As I am nearing my 1 year anniversary to the whole Blogging World, I really want to express my gratitude to all my readers who have stopped by, read my blog posts, shared posts on social media, and left comments! This give away is for you!! I have also connected with some very sweet Blogger Mommas out there who have helped me get through this first year. I have received over 6,333 Web views, and this will be my 95th Post! I look forward to what’s to come for this new year! 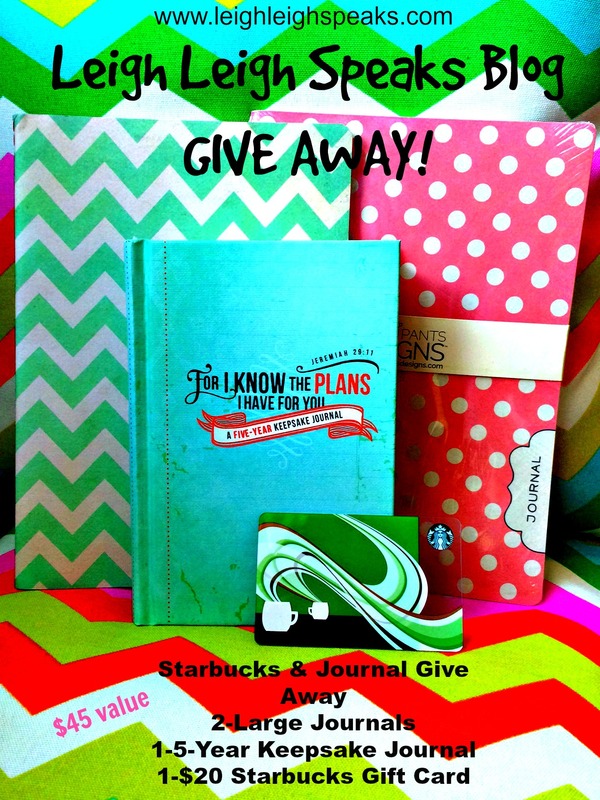 I love keeping a journal and I love coffee so I thought why not just give away two of my loves! I am using the Rafflecopter App to host this Give Away, so please follow the instructions below! Sharing is caring! If you know of a friend that would love to get in on this give away please feel free to share this blog post via Facebook, Twitter, Instagram, Email, Pinterest, however you would like! If you are a blogger, please re-blog! 1 Winner will be randomly selected and announced on my Blog http://www.leighleighspeaks.com on April 20, 2015 by 12:00pm. The winner will receive a winner confirmation email and will have 24 hours to respond. If the winner fails to respond, I will announce a new Winner on my blog and send them a winner confirmation email. *The chevron print journal will be wrapped in its original packaging as you see the polka dot one is in the photo above. The journals and Starbucks gift card are NEW! The give away bundle is valued at $45. Be sure to connect with me via Facebook and Twitter! Instagram coming soon! I journal about the things God shows me in what I’m reading and hearing. Great to look back and be reminded! Jenn! We journal the same way! I love to look back and see the growth in my faith! Thanks for commenting! Blogging through the first year is so challenging that many don’t survive! Congratulations on your sweet accomplishment. I’ve enjoyed reading this past year! Awe thank you Stacey! I enjoy keeping up with yours as well! All that yummy good you been posting lately! I still need to make the Alvarado cookies! Hi Sophia! Thank you!! 🙂 Journalling is what inspired me to start a blog! Gotta love those random thoughts! Thanks for stopping by and sharing! I used to keep a journal when my daughter was younger — about everything she did, said, etc. I’ve kind of lapsed recently. That is a sweet idea! Then you can gift it to her later in life, or just treasure it! Best of luck in year two! Love that! Lazy journaling!!! Very cool! I’m so proud of you for making it to the one year mark!!! That’s awesome. I remember talking to you when you were just thinking about starting a blog. My journal is mostly filled with prayers. It’s like writing it down makes my mind shift control to God and get it out of my head. I have in the past, but I don’t currently keep a journal. I keep a track of my sports activities and accomplishments. I love tennis and am always writing down new drills! I see you have a passion for sports! Love it! Great way to save a collection of all your hard work and achievements! I haven’t kept a consistent journal in a while. I used to write in my journal after all of my major moments or firsts (like first dates, first dance). I really would like to get back into it. Thanks for your awesome blog post!